Just How Libertarian Is Paul Ryan? Rep. Paul Ryan (R-Wis.), Mitt Romney’s new running mate, has been hailed as the closest thing to a libertarian on the Republican ticket since Rep. Ron Paul (R-Texas). “Ryan is going to be very attractive to the broad libertarian voters,” the Cato Institute’s David Boaz told Buzzfeed. But aside from his Ayn Rand-reading, entitlement-busting ways, just how libertarian is Ryan? Thankfully, MoJo‘s Josh Harkinson made this handy Venn diagram showing the various flavors of American libertarianism, from cranky Ron Paulism to traditional free-market and social liberalism. 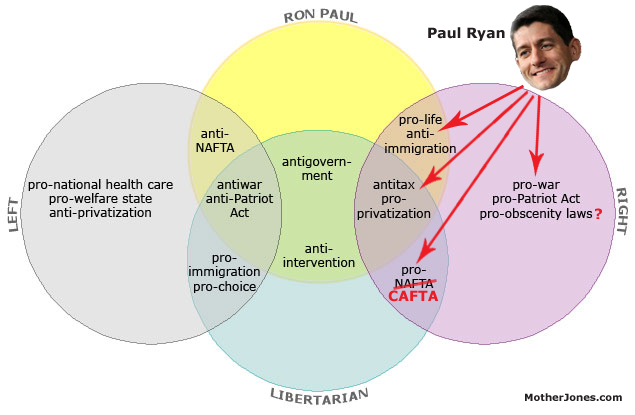 Sticking Ryan on the diagram shows that while he has a lot in common with small-government, antitax libertarians, he has a lot in common with mainstream conservatives. He has supported extending the Patriot Act, voted to fund the wars in Iraq and Afghanistan, and voted for the bank bailout—all big no-nos for old-school libertarians.